Could you bring out someone’s inner Ginger Rogers, help discover the next Ted Hughes or inspire a budding Picasso? 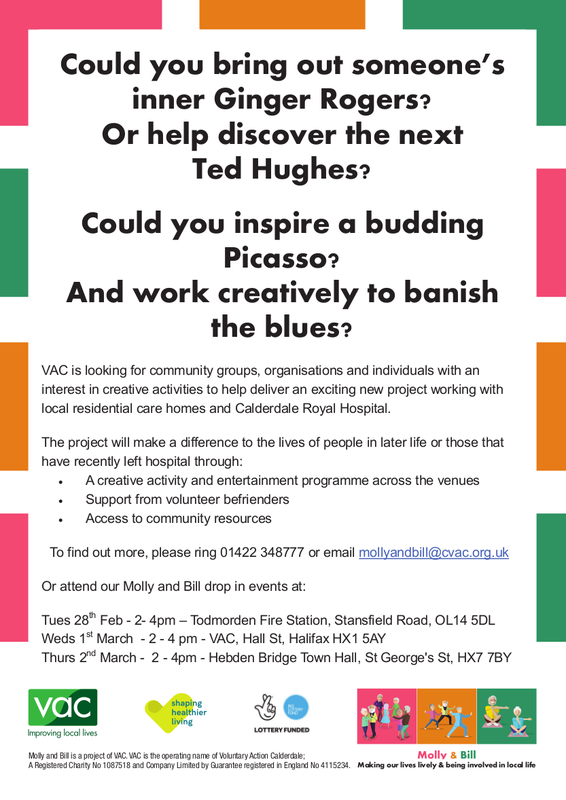 VAC is looking for community groups, organisations and individuals with an interest in creative activities to help deliver an exciting new project working with local residential care homes and Calderdale Royal Hospital. This entry was posted in Feb, Get Involved / Have Your Say, Mar and tagged calderdale, Calderdale Royal Hospital, Drop in sessions, February, Get Involved, Halifax, Hebden Bridge Town Hall, March, Todmorden Fire Station, VAC. During Dementia Awareness Week there will be events throughout Calderdale where you can ask any questions you have about Dementia and join in for a song if the mood takes you. With memory trees at each event you are invited to write a message confronting dementia to hang on a tree. This entry was posted in Brighouse, Get Involved / Have Your Say, May and tagged Dementia Awareness Week, Events, Get Involved, Halifax, Hebden Bridge Town Hall, May, Mental Health Awareness Week, Todmorden Flea Market, Woolshops. These drop-in sessions are your opportunity to find out what the council and other organisations are doing to reduce the impact of flooding in the future, discuss future flood defence plans, share flood resilience information and receive details of grants available for people affected by flooding. This entry was posted in Feb, Get Involved / Have Your Say, Mar and tagged Calder High School, Calderdale Council, Canon Winter Centre, Christ Church Sowerby, Flood Relief, Get Involved, Hebden Bridge Town Hall, Todmorden Town Hall. The Council is currently working to produce a Local Plan for Calderdale. This will set out a framework for how the District will grow over the next 15 years to meet the need for new homes and jobs. It will also identify sites for proposed development, and areas that will be protected. The consultation starts at 12 noon on Friday 6 November and runs for 6 weeks until 5pm Friday 18 December. Residents and other stakeholders will have the opportunity to comment on potential sites, and other aspects of the Local Plan, and the Preliminary Draft Charging Schedule for CIL. We are very keen to encourage residents and others involved in the community to view the information on the Council’s website and make their comments on line, using the following links to the Local Plan page on the Council’s website. The following drop-in events will be held around Calderdale and each will provide information covering the whole of the District. There is no need to register for these events, and people can come along to the venue that is the most convenient for them. This entry was posted in Brighouse, Dec, Elland, Get Involved / Have Your Say, Greetland & Stainland, Hipperholme & Lightcliffe, Nov, Rastrick and tagged Brighouse High School, Calderdale Council, Calderdale Local Plan, consultation, December, Elland Library, Get Involved, Halifax Town Hall, Hebden Bridge Town Hall, November, Sowerby Bridge, Threeways Centre, Todmorden Town Hall.